Add your gym some new and efficient gym equipment like one of our 7 best lat pulldown machines. This high pulley cable exercise machine will open a whole new world of weight and resistant workouts. A pull-down machine offers you huge range exercise like pull-ups, triceps pushdowns, cable curls, lat pulldowns, uprights rows and lots more. 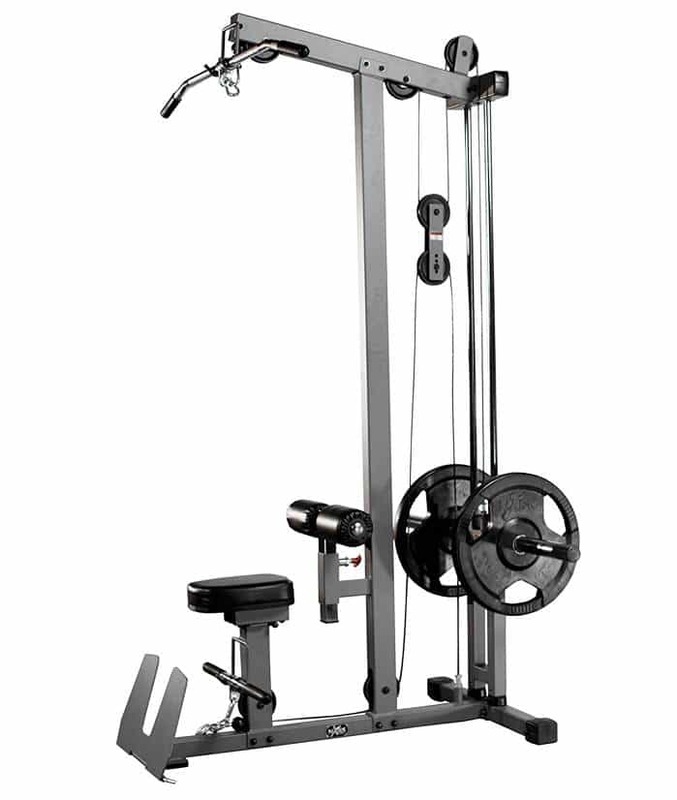 However, if you check on the market there are many kinds of top pulldown machines are available at various prices. And the quality that is also varies model to model, brand to brand and price too. So, to help you out, here we summarize some high-quality, affordable price range of pulldown machines. In this review article you will found all 7 best lat pulldown machines with their features, facilities, positive and negative sides in the descriptions including some more fact about the machine and exercise. Have a look below. For performing various type of upper body building exercise, the Powerline PLM180X Lat Machine is the most suitable one. You can do exercises like lat pull-downs, triceps press downs, seated rows, upright rows and other exercises with this one. Moreover, this lat pulls down machine features eight inches foam rollers to hold you in position and patented nylon bushing for a smooth operation and so on. First of all, it’s tall enough so anyone over 6 feet tall can use it properly. When you work with this lat pull down machine, it dramatically accelerates your strength, endurance, and your muscle mass. Second, of all, its heavy gauge steel construction gives you a robust and sturdy support so you can exercise with it for a long time. 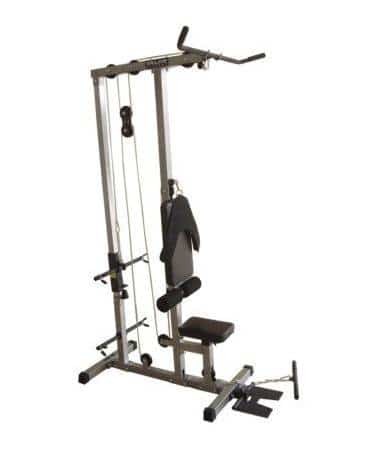 However, this home lat pulldown machine is very easy to assemble, so you individually arrange the setup with the help of some wrench, screw, etc. and if anything goes wrong, you can contact the manufacturers. Besides all these good features, the Powerline PLM180X comes with really in your budget range. It’s surprisingly cheap, but the quality remains. Although, this home lat machine seems little unstable sometimes while exercising. It is narrow and tall enough as a pulldown exercise machine but when you continuously workout on it sometime it bites shaky. Overall its one of the best and cheap lat pulldown machine that will impress you from the first day of use. Its look straightforward and good enough to serve you the best from any other lat pull machines. So, for the best upper body exercise machine in cheap rate, Powerline PLM180X Lat Machine will be the best to choose. XMark Lat Pulldown and Low Row Cable Machine XM-7618. The XMark Lat Pulldown and Low Row Cable Machine XM-7618 is a solid built sturdy lat pull down machine which targets your arms, upper back and shoulder to exercise. 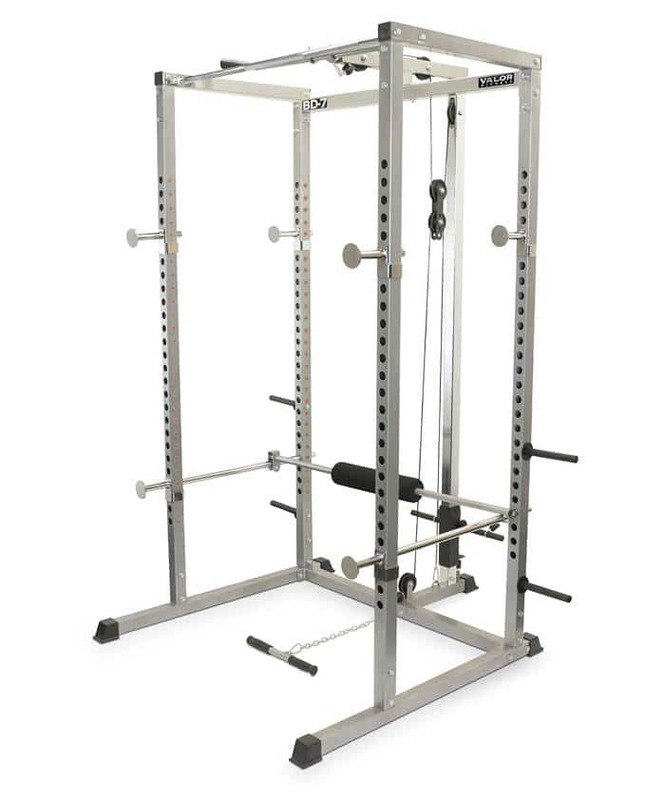 This XMARk is one of the top lat pull down machines that uses 11-gauge steel; nylon coated aircraft quality cabals, thick and fluffy 3” Dura craft cushion and a flip-up footplate to make your implement more comfortable, durable and reliable. Furthermore, this home lat pulldown machine provides, at pulldowns, low rows, bicep curls, triceps presses, shrugs and other upper body exercises. Also, the assembling of this home lat pulldown machine is quite simple. Just follow the instruction, that’s all. If you don’t think you are that to good assemble by reading manuals, ask for help or just higher someone from a local gym. Besides the manufacturer do offer a life time warranty for body frame and one year on parts like hardware, pop pins, pulleys, and cables. The low pulley is little low even for an under 6 feet people. If you seated the rows, the pull line is low into your crotch and not higher than the stomach. It’s not so many difference while workout it the only hiccup I get during the exercise. You can sculpt or tone your body just in a perfect way by the pull-down machine exercise. And this machine is worth your time, money and hard works completely. So, built a perfect body as your desire with the XMark Lat Pulldown and Low Row Cable Machine XM-7618. 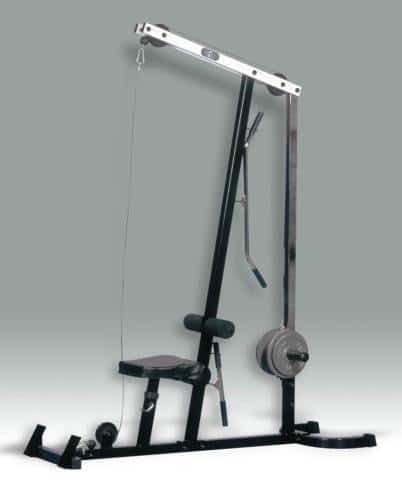 Here is another top lat pull down exercise machine which is suitable for multiple exercises. The Valor Fitness CB-12 Plate Loading Lat Pull Down offers you the sturdy base to work out and huge option for workouts. You can perform many pull down machine exercise like, Triceps Pull Down, Lat Pull Down, Seated Row and Upright Row, Standing Arm Curls, Standing Leg Extensions, Ab Crunches, etc. you can do all the exercise very comfortably. 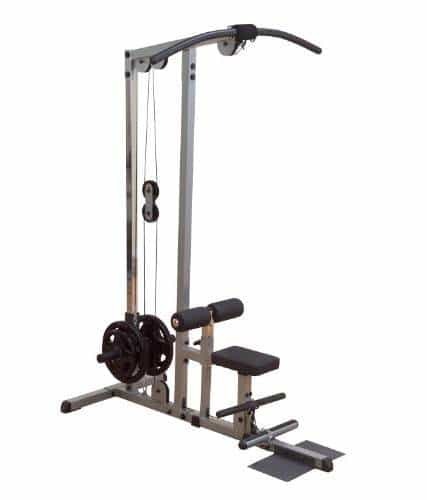 Because this lat pull-down machine also offers a high density contoured dual-layer seat pad for maximum comfort. Besides its smart and ergonomic design help you to save your room space. It doesn’t take much place to set up. In additionally, the sturdy steel frame and high tension nylon pulleys are ensured you strong performance. It has four base caps keep the lat pulldown machine stable during the exercise. Also, it’s adjusting seat pads, and footplate let you workout more comfortable. This top lat pull machine exist a real plate storage that keeps all the plate organizes and off the floor. This plate carriage holds more than 250 lbs of weights. The only problem about the home at pull down machine is the cable. During the leg abductions, this cable comes off the bottom pulley. You can get rid of this problem just twisting the cable in the middle to shorten it. The valor fitness CB-12 is one of the top lat pull-down machines that offer you full body exercise at home. But it cost very low if you compare other best lat pulldown machines. Moreover, its compact design and robust construction help you archive all your fitness goals. Just one machine is perfect for serving all your needs. Here is another top lat pull down machine for upper body workouts. The Giant Econo Lat Machine comes with various features and quite a good performance. This machine has an adjustable padded seat. So you can adjust the height to your requirements. People those are more than 6’ can easily use this device. Also, this top lat pulls down machine is work for triceps pushdown, seated rows seated curls, etc. workouts. The machine has full two free padded lat bars (48 and 18”) for pull ups. Also, its foot plate maintains a correct biochemical angle during low rows. The construction quality of this top lat pulldown exercise machine is amazing. Everything is perfect and described well in the manual. When you are going to assemble the machine, it will take not more than just an hour. It’s the perfect lat machine to use for weight exercise without any error. Besides, this home lat machine had many other features like quick cable change facility and built in bar storage. So you can store the weights your requirements and use frequently. It’s a great usable machine that comes with a decent price too. 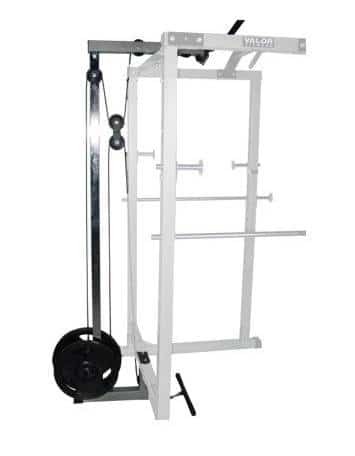 So, if you are looking for a quality home lat pulldown machine, then you can choose the Giant Econo Lat Machine. It is one of the most comfortable lat machines that come with many exercise options. The Body-Solid Pro Lat Machine is very sturdy and well-built pull-down the machine. It has thick and comfortable seat pad that allow you to exercise more relax. Moreover, its multi-position 8 inches from rollers lock your position for high pulley lat works. In additionally, this lat pull down machine comes with a lat and straight bars. It’s no cable change technology make the transition between your high and low pulley exercises more effortless. You can do workouts in it’s for a long time and proper without stress or stiffness into your body muscles. This machine can’t have any weight storage to keep your weights. So obviously you will need another storage or racks for west of weight stuff. Also, the price range compares to other six lat machine her is little high. Over all, it’s a great machine to use your daily weight exercise. So for extended period choose the most efficient machine of Body-Solid the Pro Lat Machine. The Valor Fitness BD-7 Power Rack with Lat Pull Attachment brings many types of resistant exercise for you. Such as, at pull downs, squats, military press, pull-ups any so one. Also, you can do incline bench, shoulder press, squats, and deadlifts too with the machine. Its sturdy frame construction is perfect for your daily exercise. If your want to tone your body on short time, then this top lat pull down exercise machine will be like the ticket of your giant entry. Although, the power rack of this machine made for the support you on your quest to sculpt a new physics. It’s including features like four weight plate storage pegs; steel main frame and chrome adjustable weight bar support are great for your upper body exercise. If you think this rack will complicate to assemble, then you not right. This stand is very easy to put together. You just need to follow the instruction. In this manual, the explicitly instructed and provide necessary tools for you. But it requires more space than our other 6 top lat pull down exercise machines. For loose weight and build perfect muscles there is nothing like power racks or squat racks. After using of few months, you notice some positive results on your body. This machine is also great for more than six feet height people. The manufacturer of the BD-7 Power Rack provides full support for your need. So if you face any problem during the set ups or later, they will support as much as possible. Valor Fitness BD-11L Lat Pull Attachment for BD-11 Hard Power Rack. Here is one of the cheapest and effective lat machine attachments named Valor Fitness BD-11L Lat Pull Attachment for BD-11 Hard Power Rack. This top rated lat pulldown machine attachment offers many kind resistant workouts including Lat Pulls, Triceps, Upright Rows, Curls, Leg Extensions and others. It’s 12 gauge steel made construction give your adamant and reliable settings so you can exercise more frequently. It’s specially designed to attach the BD-11 rack. It may fit some other racks too. During the weights sliding, it almost soundless or won’t make any noise that can bother you. Steel constructions often make sounds while working out. But not this one, even when the wheels are running, though. The motion of this top lat pulldown exercise machine is completely fluid and sturdy enough. If you think about the price and features this machine is the perfect combination of quality materials and service. The Valor Fitness BD-11L Lat Pull Attachment for BD-11 Hard Power Rack is a complete attachment. It comes with pulleys, cable, and hook. But you have to buy lift bars separately for this lat machine. Besides it works very well to anyone. How to Set Up & Use a lat pulldown machine? Start your exercise by sitting in the post or the seat and keep the lag onto foot-restraint pad. Adjust the height as your need. Keep your feet flat; the leg restraint pad will be in the position so the legs won’t lift up. Once all setup is done take your legs out and stand up. Start with the lower weight; don’t push your ability to the high weights, at once. Your weight should be enough to fatigue your muscles in 8 to 15 repetitions. Facing the weight stack grab the bar with a wide overhand grip. Holding the bar sit back and place your leg in the first position, then start to pull. Keep your body straight, exhale and pull the bar down to your chest. Your elbow will point back, take a breath and repeat slowly then gradually speed up. But don’t overdo it. Aim for 1 to 3 sets and 8 to 12 repetition. Don’t move your wrist backward or forward either. Bring your chest to the bar by keeping your chest tall. Now pointed straight down your elbows. Squeeze your lats or pull from your armpits. Half kneel; Keep your front knees at 90 degrees on the ball of the back foot. Now grip the same hand as back leg. Your elbow should point straight down at the bellow. Start thumbs down and finish thumbs up as you pull. Now pull from your armpit when the lat has tight, stop the process. One machine for multiple workouts- Usually, it’s a multi-joint exercise that involves movement at your elbows, shoulder, forearms, etc. so, just in a single exercise, your different body muscles of the upper body start to work together. However, your biceps, rear delts, back muscle, traps and rhomboids also active during the exercise with the pulldown machine. Do more with less effort– It does not mean you have to exercise less for huge benefits. It means the machine allow you to exercise more effectively within less effort. Such as, when you are performing pull-ups in a lat pulldown machine; you don’t need to lift weights by forcing all your body weight. You just seat on the bench and pull-up just by pulling yourself toward the pull bar. You have made less effort to same weight on a pull-up machine. Don’t make you board- For the availability of the various type of exercise, a top lat pulls down machine never get you bored by offering the same kind of exercise every day. Also, you can experiment with different type of exercise or challenge yourself if you want. Taking the bar and pull out to your back to head. This type of moves gives exceptionally pressure on your spine rather than the muscles. Also, it can hurt your shoulder too. Pulling the bar to your waist is another one. So your arms are rotating forward to move the bar to the waist. It’s a full wasted motion doesn’t bring any benefits to your body. Also, it often causes shoulder pain. Make the hand grip very wide. Normally a bar of all pulldown machines is about 4 feet wide. Some user even some trainer also think that you should need to holds as full as possible. This mistake often reduces your motion power and create shoulder problem. To avoid this error, make a narrow grip like 3 to 6 inches wide from your shoulder. This type of machine serving the largest verity of users ranging from beginners who are getting used to lifting free weights to advance athletes who are looking for always a huge verity of workouts. So, before going to buy, let’s see why you need to have a top lat pull down machine particularly. For safety- exercise with a pull-down exercise machine is much safer that free weight. After all, there is less risk of fall of the weights. Versatility- pull down exercise machines fit the requirements of multiple users and their fitness needs. The full range of exercise- a home lat pulldown machine offers a wide variety of exercise options and provides whole body workouts. But not all machines allow you to exercise for the entire body; it depends on which type of lat pull down machine you have purchased. 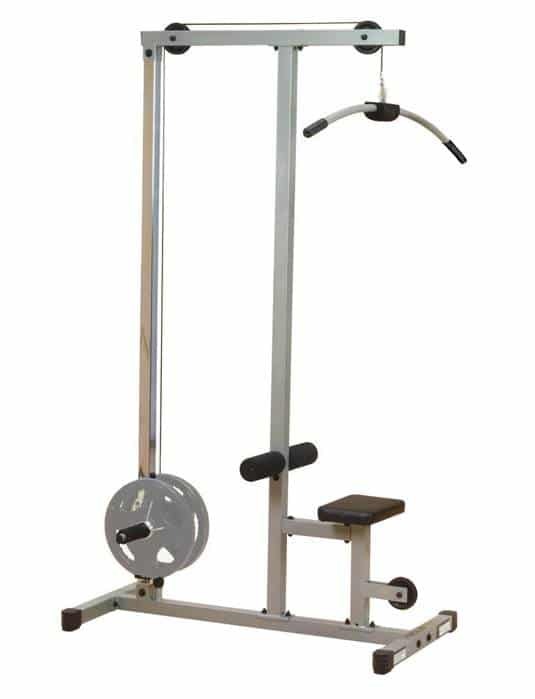 Price vs. quality- Usually, for lat pull down machine the higher quality indicates lots of features consisting machine with quality materials, higher weight capacity, comfortable seat or supporting pads and well construction. And for that, the price is not always bound the limit. Some brand does offer some good quality product within minimum budget range, but you have to sure about their actual quality and customer services. Besides, the price is not always a good indicator to buy anything. So before going to have a top lat pull down machine ask you some of these questions first. Q- How much weight I can currently lift? Q-What exercises exactly did I want to do with the machine? Q-What feature I need for my exercise? Q-How much weight I want to lift? Which lat pulldown machine is the best for you? We have tried to explain about all these top 7 lat pulldown machines in this pulldown machine review article. All these machines are suitable for upper body, whole body, upper plus some other individual exercises. If you are looking for the whole body workout machine than the Valor Fitness CB-12 Plate loading will be ideal to use. Otherwise XMark Lat Pulldown, Powerline PLM180X, etc. are also great workouts. Lat pulls down machines are best of both worlds where you can safely lift weights and get intense exercise. Also, they are quite safer than free weights that usually a body builder want to work with. A home lat pulldown machine’s pulley system controls the weight along with a guideway. However, this machine is incredibly versatile and offers lots of different exercise from chest press to lat pull downs, cable’sfly to leg press and so many. If you truly want to make a tone and sculpted body like professionals, then it’s time to rearrange your home gym and make a tight routine for workouts. So enrich your gym with the best lat pulldown machine and take your workouts to a new level. Thanks for your informative post…I’ll definitely have to check out some of those lat pulldown machine!!!! Thanks Jimu for your opinion..